Hii! I’ve currently closed my inbox for volunteer interest, you are all so wonderful and all want to volunteer and I’m just working through it all now! If you would like to send your own lovely letter or letters (there is lots and lots to send! ), a letter to remind someone how wonderful they are you can do so here and if you include your email address I can let you know where in the world it has ended up! I am going to be curating ‘Find the right words’ exhibitions. The concept of these exhibitions are for you to send me the letters you would send to someone you loved to remind them how extremely important and special they are on the days that they forget. These exhibitions can be anywhere in the world and anybody who visits the exhibition will be able to take the letter that they feel is talking to them right at that very moment, or the letter they feel someone they love needs. The idea of someone from New York lending some lovely words to someone in Birmingham – someone in Manchester writing a letter that will end up in the pocket of someone in Delhi – it’s so exciting to me and to be able to have you involved will just be absolutely awesome. You can send your letters to me at the address above (and below!) and if you could write on the envelope Find the right words that would be just wonderful! The Letter you never sent. I have so many letters I have never sent, sometimes the act of just writing what you want to say down is enough – other times not. What this exhibition will consist of is all of our letters. The letters that for some reason or another we never got round to sending, whether we didn’t want to, didn’t get round to or felt it best kept with us. If you have a letter that is at the back of a drawer, under your bed, in the notes on your phone or a word document – typed or handwritten, whole or in pieces – if you could send them to me, I would be so grateful! With the subject line: The letter I never sent. 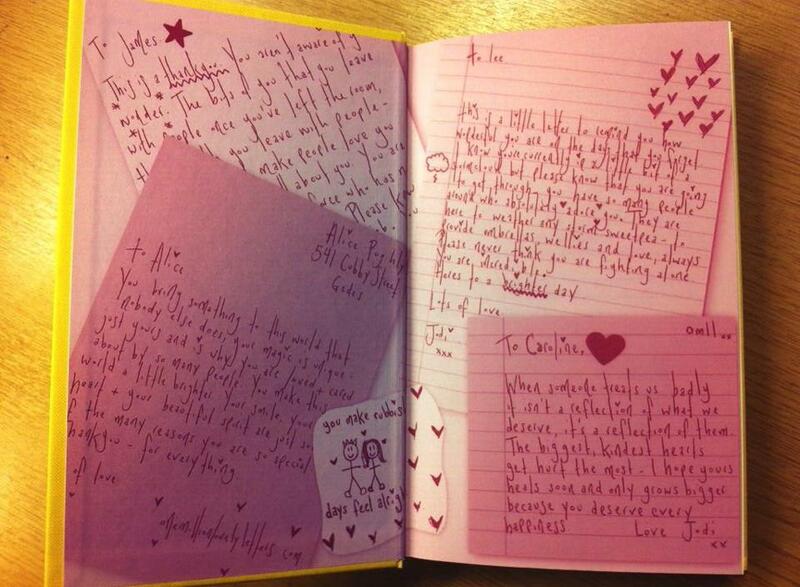 ‘One Million Lovely Letters’ the book! I think you are lovely. What a great idea. My sister in law had a stroke 3 weeks before she was due to get married but has since proved to us all what a positive mind can do. Hi Jodi, I think the stamp fund a great idea as it is costing you money (and more importantly your time) – whilst we can’t give you the ‘time’ back (and one of the most important things in life you can give anyone is ‘time’), we can help fund future letters to other people. Thanks for the letter you sent to Chris by the way. Big smiles, James (Worthing). You are amazing. After reading about your story and watching you speak i was overcome. I wanted to do something so stamps it was. While orangina is perhaps the finest beverage on the earth, helping to mail a letter seemed more important today. Thanks for making a difference. Please consider doing a gofundme or something similar. I’m sure many people would love to contribute to your WONDERFUL passion and help you spread your cheer far and wide. I think it takes a very special person to be so compassionate and caring for those that she doesn’t know so well. Crazy props to you! I stumbled upon your website through a newspaper article. Its not much, but I’m donating towards your stamps. I am a professional fund raiser – so if you ever have any questions and want to bounce them off someone in the industry, do feel free. I’d imagine I’m not the first to offer that particular service, but given what you do, I have to offer. Hope this reaches you on a good day, and if not, hopefully it makes it the tiniest bit better. I really love this whole concept! I would love to volunteer and help sort out letters and do anything possible, it doesn’t say anywhere else on the page how to. Does anybody how to contact her for this type of thing! Hi, Jodi. I am a greeting card designer. I always love cards. I think when somebody take a time to stop their life to right a message to someone is beautiful moment of compassion=love. I loved your idea to send the letters out. I always wanted for my cards to have a deep meaning. I wonder if I send you 50 cards +stamps you can use them for Christmas. Hi Jodi. When I saw you on Surprise Surprise I had to keep rewinding and show everyone in my family. Without going into to too much detail here but would be happy to share with you sometime. I help others too but in a much different way to you, and I think what you do is absolutely fantastic. You are such an inspiration and I would love to meet you one day. With love and best wishes sent for all that you do. What an amazing idea, I wish I’d have thought of something like that. Everyone is so immersed in technology and busy lives we have lost the ability to notice when someone needs a lift. I would love to help and get involved, I miss writing a proper letter. Keep on giving you lovely lady you’re an inspiration. Such a beautiful, kind and generous idea, what an inspiring and amazing person you are.